Here's the spa of the future. Step in for the warm comfort and relaxing massage you expect from Sundance® hot tubs, in an amazing spa design that looks at home in any backyard. Shelf-style cabinetry-finish top deck conceals acrylic. Exterior lights include dusk sensors. Multi-level cool-down seat helps you get in and out of the spa safely. The Victoria also debuts the first-of-its-kind lounge seat that opens up a new experience in hydrotherapy. Sundance hot tubs' exclusive jets target the entire body, neck to feet, including the hard-to-reach hamstrings and calves. Advanced Sundance hot tub materials resist UV and weather damage. New MicroClean® Select system optimized to filter 16,000 gallons a day using less energy; high-flow circulation. 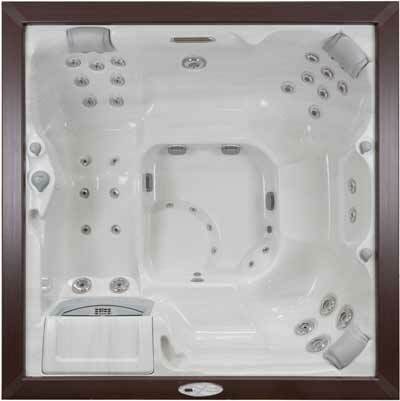 Select Series spas reduce operating costs.